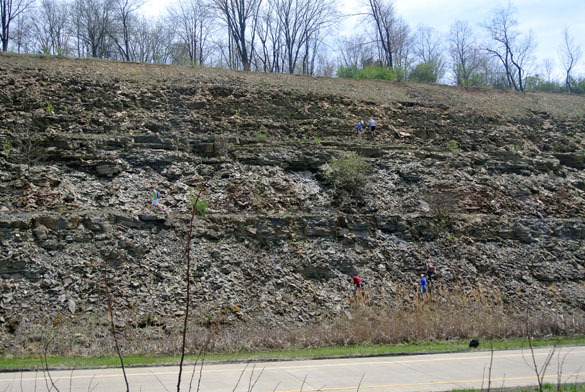 WOOSTER, OHIO–The traditional spring field trip in the Sedimentology & Stratigraphy course at Wooster is taken several hours south, usually in Jackson County or, as last year, in a soggy quarry outside of Dayton. 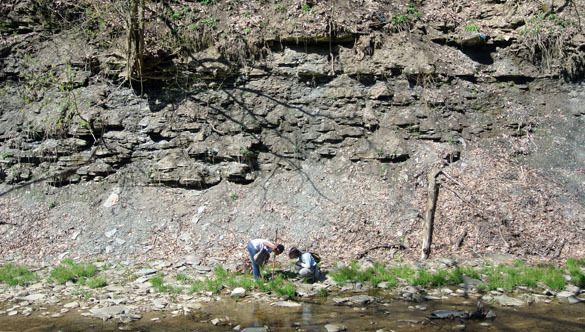 This time, though, we stayed nearby, measuring and describing the local bedrock: the Meadville Shale Member and the Logan Formation, both in the Lower Carboniferous. We had a spectacular day with the best weather Ohio can offer. Our first location, shown above, was in Lodi Community Park about 20 miles north of Wooster. A tributary of the Black River (the East Fork Black River) flows through a small valley, exposing the Meadville Shale in its steep sides. The Meadville is a member of the Cuyahoga Formation and is late Kinderhookian in age. The students above are beginning to measure the unit with their Jacob’s staffs. Candy Thornton and William Harrison are here at the exposed base of the Meadville. 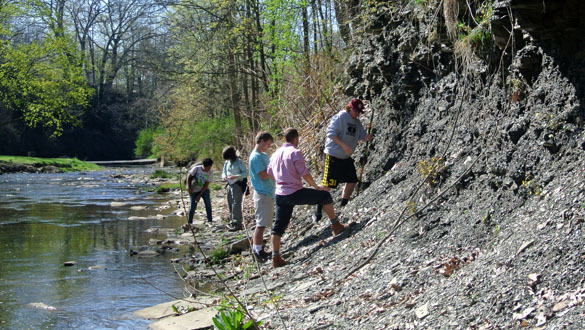 They’re taking a break from geology to examine a salamander they found on this fine spring morning. The Meadville is in part very fossiliferous. We found crinoids, bryozoans, bivalves and brachiopods like this nice spiriferid above. 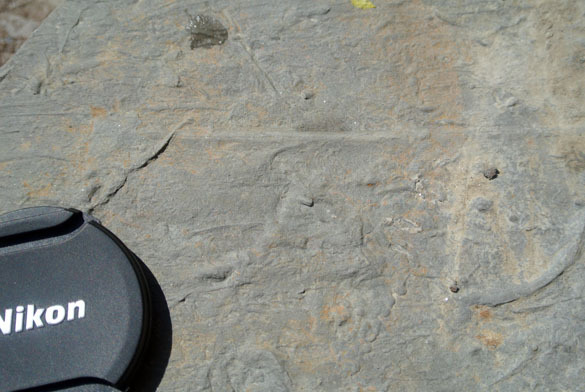 An interesting feature on the soles of some thin siltstones are these long, parallel grooves called flute marks. 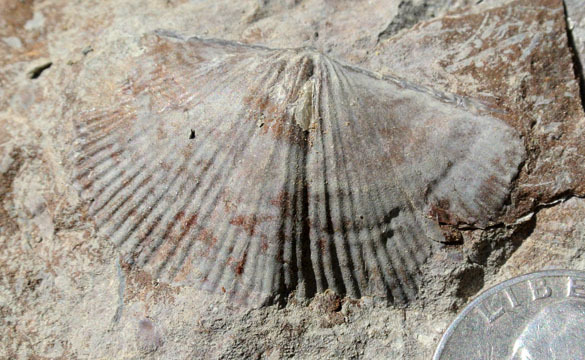 They were made when shells were dragged across a muddy substrate, leaving scour marks. 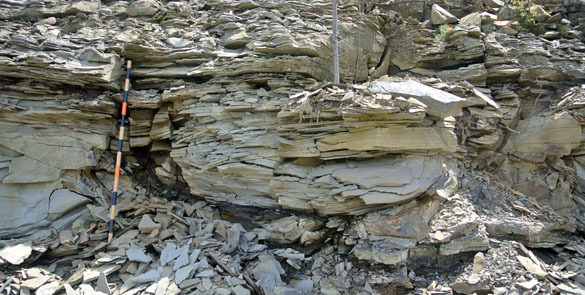 We think they represent the basal unit of thin turbidites formed by sediment slurries that flowed across the seafloor. 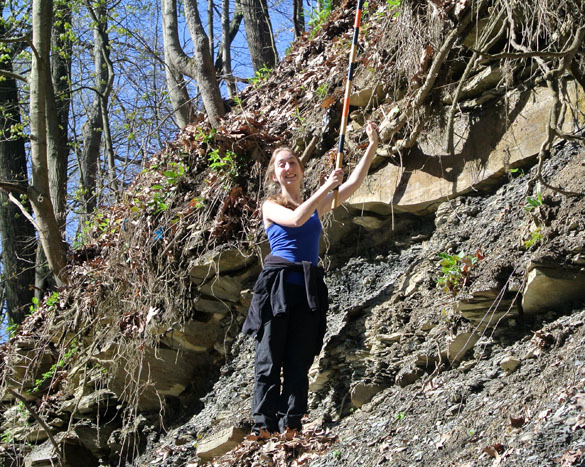 Sarah Frederick climbed high on the outcrop with a measuring staff to describe the transition from a silty shale to a very fine sandstone. 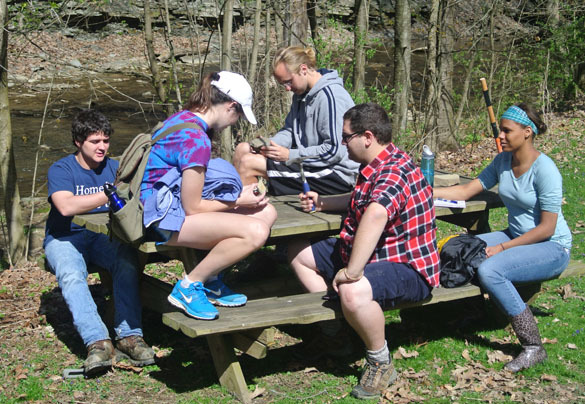 Here a group of Wooster geologists compares notes as they construct their stratigraphic columns. Yes, this sunlight felt very good to us. Our afternoon stop was in southeastern Wooster along the onramp from north Route 83 to east Route 30. The Logan Formation exposed here is a Lower Carboniferous (early Osagean) very fine sandstone and conglomerate. This site is near what was once known as “Little Arizona” to older Wooster geologists. That exposure was mostly removed when this new onramp was constructed. The base of the Logan has an extensive conglomerate sometimes referred to as the Berne Member. 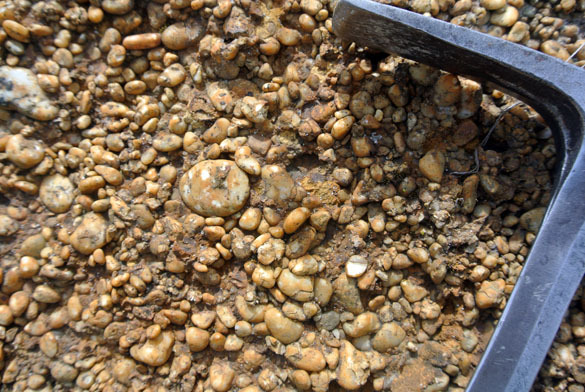 As you can see, it mostly consists of rounded quartz and chert pebbles, making it a very mature sediment. One of the distinctive features of this Logan outcrop are these large dewatering structures. These form when a water-rich slurry of sediment is forced upwards through the sediment above. Vertical channels are made between the rounded bases of sandstone bodies. One interpretation of these structures is that they were produced an earthquake shaking the water-saturated sediment. If this was the case, we would call these seismites. Here a happy group of geologists is returning to the vans with various fossil and rock specimens. Now it’s time to write the reports!